Eurytania, Evritania, Evrytania, Karpenisi, Karpenissi, Agrafa, Central Greece, Luxury Hotels, Resort in Greece, Holiday Accommodation. 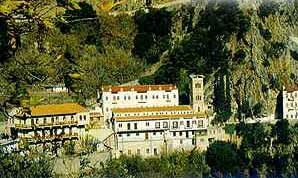 Karpenissi is the capital of Eurytania, has built on the foothills of Mount Timfristos at an altitude of 960m/ 2438ft. The spectacular countryside of Eurytania enchants anyone who approaches it. The healthy climate, the forested slopes, and the countless streams give the impression of heaven on Earth. Karpenissi, the district capital is built on the foothills of Mt. Timfristos, at an altitude of 960 metres. Among the plane, fir, and chestnut trees, Karpenissi is ideal for winter vacations and an alternative proposal for the summer, when it can be a springboard for excursions to nearby places, such as Gorgianades, Kefalovrisso, and the traditional village Korischades, whose stone houses are in good repair. A small fir tree forest and gardens with apple, cherry, and pear trees in Mikro Horio. On the slope of Kaliakouda, opposite Helidona, is Megalo Horio. Proussos is at an altitude of 800 metres and east of Karpenissi is Krikelo close to Kokalia a historic location among the fir trees just before Domnitsa itself a village of many chapels located in enchanting surroundings. West of Karpenissi are Fragista, Granitsa, and Agrafa, lovely mountain villages, which disappear in winter under a thick blanket of snow.